And after all, even if it were deeply nerdy to read the study notes alongside the novel, she didn't care a bit; for it only enriched her feeling for the story, made her notice details she had never seen before: the way each character was compared to a bird, for instance; the flow of the words, like a river, eddying and swirling one along so deliciously, so that one simply had to surrender, to lie back and submit, dreamily, like Ophelia. And she remembered how much she had admired Virginia Woolf, years ago, when she was an undergraduate; had worshipped her, read every book she wrote, although a little frightened of her too, this sad goddess who had put stones in her pockets and walked into a river and drowned. And yet there was such a love of life in all those words, a grasping and a letting go, from moment to moment, the sunshine and the flowers and the desperation, the lovely girls and the pompous men; and she had wished that she could write like that! It was the merest accident of hearing that podcast by Mervyn Bragg that had made her pull down the book from the shelf again; and she was glad, so glad! (And how odd it was, that she couldn't find anywhere a picture of her own novel's cover -- as if only one copy had ever been produced, especially for herself.) 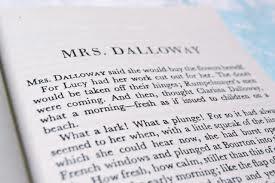 But was the gladness enough to make her re-read The Hours as well? No; there were limits to devotion; imitation was all very well, but in the end, there could be only one Virginia. Let me say first off, huge congratulations to Charlotte Wood for winning the Stella Prize with this much-lauded novel, The Natural Way of Things, and her inspirational award speech. This is without doubt a powerfully written, deeply interesting novel, a grim, meaty fable set in the not-too-distant future, where a group of young women (all survivors of some sexual scandal or another) find themselves imprisoned in a remote, dystopian location. There's been a lot of buzz around this book and I was very keen to read it (thanks to Fiona, my hairdresser, who passed it on to me). And there is much to admire -- the concept is strong, the writing is lean and springy, the setting both beautiful and frightening. I'm really glad I read it, and Charlotte Wood deserves every award she gets! But for some reason I couldn't quite lose myself in this novel. Maybe I'm just at a place in my life where I can't handle too much darkness, and I'm turning away in self-protection, in case I get swallowed up? Maybe I'm just a lazy reader at the moment, looking for cheap comfort? Sometimes I felt frustrated with the women -- they were so judgmental of each other, and they submitted so passively to their imprisonment -- if this was a YA novel, they would have been plotting escape in the hundred pages! The Natural Way of Things remains a remarkable achievement. But it's just not the book for me right now, and that's okay. 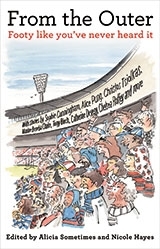 From the Outer is a collection of short pieces about AFL football, edited by Alicia Sometimes and Nicole Hayes, it includes chapters by Christos Tsiolkas, Angela Pippos, Alice Pung, and even football hater Cath Deveny, among many other voices -- some famous, some unknown. There are pieces by the first female umpire, a star player in the women's game, the founder of a LGBTI supporters group, disabled fans, many migrants who found that footy was a pathway to a sense of community in a strange land; fans who were born into a team, and fans who made a conscious choice; people who for many reasons speak 'from the outer', in the sense of being on the margins of society, and who (in most cases) experience the game from the outer, as spectators and supporters, rather than on the field. There are passionate fans, ambivalent spectators, those who have fallen in love with Aussie Rules and out again, some who can't stand the game (well, one). As Miriam Sved puts it: '...part of the appeal of footy, maybe of any sport, is stories,' and there are a multitude of stories here. When I bought this book, it was just before Round 3. My beloved Western Bulldogs had started the year in a blur, blitzing their first two games to sit high atop the ladder. We were looking forward to meeting the all-conquering Hawthorn in our third game, to measure our team against the very best. I took the Kindle to the ground with me, to read it at half time. By the time I finished reading it, round three was over. The Bulldogs lost -- by the slimmest of margins, and they dominated the Hawks for a good chunk of the game. We are the real deal. But the loss of the match was rendered almost irrelevant by a much worse blow -- an horrific injury to captain Bob Murphy, our club's beating heart, a footy romantic, a seemingly ageless veteran leading a team of young pups toward success... But Bob has done his knee. He won't play for the rest of the season. Given his age, he may decide never to play again. There could hardly be a clearer demonstration of all the ways that footy can break your heart, or the sweet hopeful promise that lures you back in, despite the pain. Come back, Bob! It wouldn't be the same without you. Goodness, I'm getting behind! I'm going to skip over Tove Jansson's The Moomins and the Great Flood, the junior fiction title for the Convent book group this month, just because it's a such a short little book and I read it on the Kindle, which compromised my appreciation of the illustrations, I think. But it was the first Moomin book, and deserves kudos just for that. Moving briskly on, I'll talk about Hills End, which was the first Ivan Southall book I read as an adult, a couple of years ago, and which blew me away. 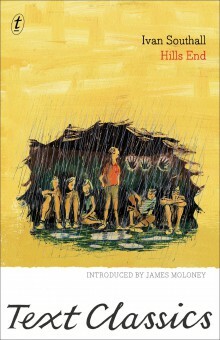 In it, a group of children -- the oldest are about thirteen -- find themselves isolated in a flood-wrecked town, with no adults to take charge. (Our theme this month is Flood, if you hadn't guessed!) Will they survive, or be overwhelmed by the challenge? Of course, they rise to the situation magnificently, but not before almost going under. These kids are very resourceful, brave and determined, but they are also realistically children. They bicker amongst themselves, think it's a great idea to wash in lemonade, decide to make sausages out of rotten meat, burn the stew and almost set the building on fire, are terrified of the dark and the eerie fog. But they are capable of more than they know, and their victory is fairly won. I think this is my favourite Southall book. The balance between the characters' internal doubts and fears, and the gripping action, is just about perfect here. In Ash Road, the bushfire threat is so overwhelming that it leaves the protagonists little to do beyond mere survival; in To the Wild Sky and Bread and Honey, the interior lives of the characters take up so much room, there's no space for much to actually happen. I thoroughly enjoyed this re-read, although I raced through it pretty swiftly! Helen Garner is the writer I admire most in the world, full stop. I love her sinewy, finely balanced sentences (she says she learned from Janet Malcolm 'to make her verbs work hard), her pitiless eye, her wry compassion, the lacerating honesty that spares no one, least of all herself. Everywhere I Look is a collection of short pieces, many of which I've read before in the pages of The Monthly magazine. (When a copy of The Monthly arrives in our house, I always check eagerly whether there's a Helen Garner piece in that issue.) It includes extracts from her diary - my god, how much would I love to read the whole thing? Some people are discomfited by the way Garner includes herself in what she writes, but to me it seems the most honest and the hardest stance. 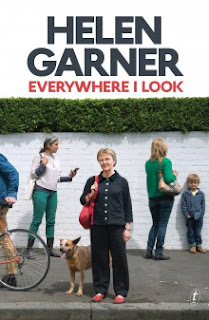 I wish I had the discipline and the gift for words, the gift of observation, that Garner has. But I think if I were to meet her, I would be a little bit scared of that merciless gaze. She can be so tender and so humorous, but she reaches for anger quickly, far more quickly than I do. She has a gift for rage, and as she grows older, she is less prepared to censor herself. Which makes her exhilarating to read, but possibly a terrifying friend. I wish Everywhere I Look was three times longer. In heaven, there will be a new Helen Garner book every week. So this was supposed to be the year when I made a serious assault on the Pile Beside the Bed. I made a secret vow: no buying any more books until I'd made my way through the ones that were already waiting! And here we are, well into April, and the Pile has been upgraded to the Tower, despite all my intentions to the contrary. My friends lend me books. Sandra Eterovic lent me Paul Daley's Collingwood: A Love Story, which joins her copy of Middlesex, waiting on the Tower. 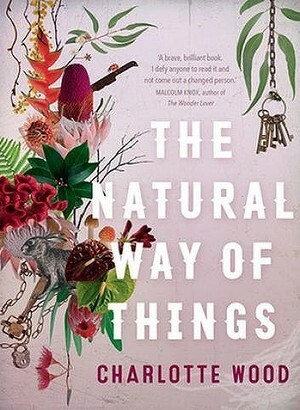 My lovely hairdresser Fiona has not just lent but given me her copy of The Natural Way of Things by Charlotte Wood, which is definitely next on my list. I listen to an In Our Time podcast about Mrs Dalloway and search my shelves under Virginia Woolf and pull out my copy for a re-read... I realise that there are new books out by Jaclyn Moriarty and Helen Garner or an Antonia Forest reprint and I have to Make An Exception to my no-new-books rule. And there are books to read for the Convent book group, two a month, so I can't dig into the Pile -- sorry, Tower -- until I've knocked over those... It never stops! There's always something calling! And I wouldn't have it any other way. But maybe I need to start reading from the bottom of the pile occasionally! It's not even a year since I last read Antonia Forest's The Marlows and the Traitor! And yet I enjoyed it just as much, if not more, the second time around. There are many books that I would never even contemplate re-reading, however much I relished them. I once tried to re-read AS Byatt's Possession, a wonderful, rich novel that I adored. But trying to swallow it again, even a decade after the first time around, was just too much. I felt simultaneously daunted and bored. I could remember what was coming next just well enough to be put off continuing... and there were so many pages... I gave up. 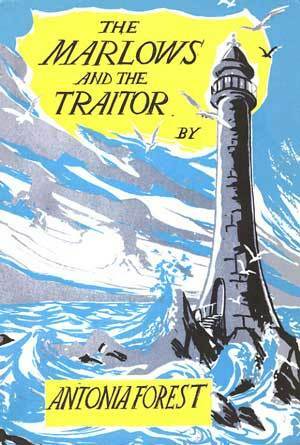 Luckily The Marlows and the Traitor is a very different beast, though equally wonderful in its own way (much less ambitious, obviously). I read it with breaks between each chapter, during which I would scurry across to Trennels at LiveJournal, a forum for Antonia Forest fans, to follow the commentary from their MATT read-through from a couple of years ago. 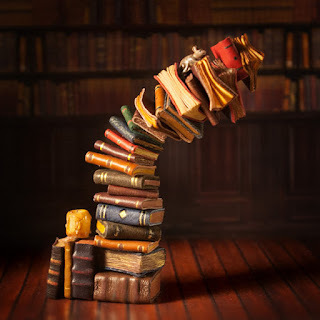 To be able to consume a book in the company, so to speak, of a group of witty, erudite, thoughtful and attentive fellow-readers, who mostly know all the Marlows books back to front and have a multitude of opinions, observations and personal head-canon to share, is one of the most blissful benefits of the internet age. I just dive in and wallow, luxuriously, like a hippo. All this in preparation for the arrival, next month, of Falconer's Lure, the third volume in the series. I feel as excited as if an old and dear friend were coming to visit. So much catching up to do!